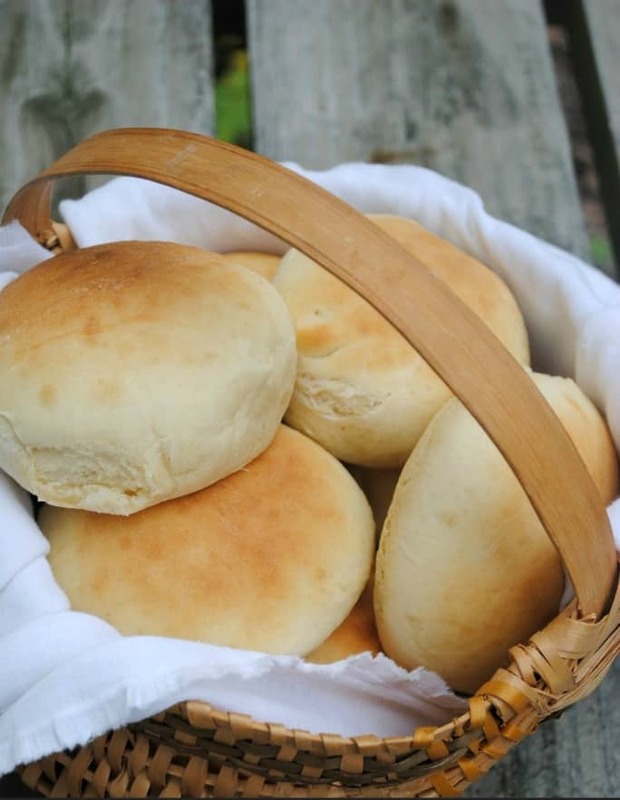 If you’ve been around here very long, you know I like to use soaked, sprouted or sourdough whole grains in my baking, but sometimes, yes sometimes, you just need a good ol’ white bread bun or roll. You don’t want to buy something at the store because they have about a million different ingredients, most of which I have no idea what they even are. That’s when these fast homemade buns come in handy. These are not difficult in the least bit, so there’s really nothing holding you back from having yummy homemade buns or rolls on the dinner table in an hour, start to finish. Most of that time is rise time, so when I say easy, I really mean easy. 1. Bloom yeast in warm water. Ooops, forgot to take a picture. 2. Dump everything in a mixer and knead with a dough hook until smooth and elastic. 4. Place on a baking stone evenly spaced or a greased cookie sheet. A stone doesn’t have to be greased. Cover and let rise about 45 minutes. 5. Bake, let cool, and EAT! See? Super easy! Anyone can make these homemade buns, so don’t be skeered. You can do it, friend! These will be great this fall and winter with some pulled pork or beef, leftover roast, burgers, or sloppy joes. 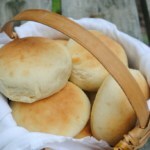 Easy and delicious soft homemade buns or rolls in a little over an hour. In a measuring cup, sprinkle yeast over warm water. Allow to dissolve and foam (bloom) for about five minutes. Dump all of the ingredients, including water and yeast in stand mixer. Using the dough hook, knead on "stir" setting for 3-5 minutes, until smooth and elastic, adding additional flour if needed. On a floured surface, turn out dough, and divide into desired amounts. Rolls(24), Small buns(12), Large buns(8). Shape into balls and place on a baking stone, evenly spaced apart. Easy to make and taste creat. These look great, Tara! I’m going to make them today. Think I could sub in half whole wheat flour?